Lil Boat and Migos blend into the background in the rapper’s latest video. Lil Yachty's latest music video is dark, literally. The visuals for "Peek A Boo," which have already amassed over a million views on YouTube, have Yachty and a group of women painted pitch black and standing against a black backdrop. Yachty's bright red hair is the only splash of color we get. "Peek A Boo" dropped late on Thursday night and features Migos, who make an appearance in the video, unpainted. "Peek A Boo" dropped late on Thursday night along with "Harley." 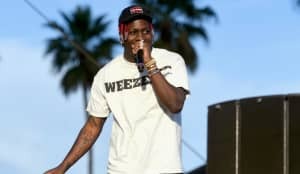 Yachty's debut album, Teenage Emotions, is expected later this year. Watch the video for "Peek A Boo" above.